Sonam Gupta has taken the internet by storm, again. She made headlines in August this year initially, but is now back after PM Modi announced the demonetisation of Rs 500 and Rs 1000 currency notes. We bring to you her story. If you are active on social media you would have, by now, come across a tattered 10 rupee note on which “Sonam Gupta bewafa hai (Sonam Gupta is unfaithful) ” is written. A jilted lover once wrote these words on the note, possibly to warn people about Gupta, the unfaithful. The note travelled miles, moved to different cities, and finally reached some fellow who clicked a photo of it and put it up on the internet. Sonam Gupta became an internet sensation in August earlier this year. She became the face of betrayal, and the internet despised her. On one side ‘Sonam Gupta’s protested stereotyping, and on the other, mostly men, empathised with the dejected lover. As prime minister Narendra Modi announced the demonetisation of Rs 500 and Rs 1,000 notes on November 8, when beloved currency notes ditched the possessors, Sonam Gupta reappeared and is taking the internet by storm again. Her story has moved on from a torn note to freshly released Rs 2,000 notes to coins and has even reached the moon. There is also this image of a 100 rupee note that is going viral, for it has Sonam’s reply. 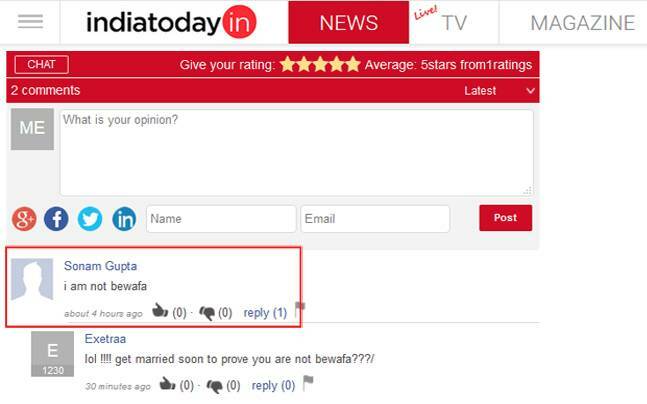 Over 88,013 people on Facebook are talking about Ms Gupta and over 27,145 people are searching “Sonam Gupta bewafa hai”. Sonam Gupta was just another girl you meet in colllege, except she was not. She was not the most beautiful, going by the beauty standards set the society — tall, fair, lean — but had something about her that drove people to her. She was one of those who walked with her head held high. Like in almost all Bollywood stories, there was a hapless chap who fell madly in love with Sonam. He was the “Raanjhana” to her. She was the woman of his dreams, future mother to his children. But, to him, Sonam’s consent never mattered. Like Bollywood taught us, even with the latest Karan Johar directorial where Ranbir Kapoor and Shah Rukh Khan, both victims of unrequited love, that the hero, whether the heroine wants or not, should end up with her. With the power of “ek tarfa pyaar (one-sided love)”, the Raanjhana proclaimed his love for Sonam. He did everything he thought was right — from red roses to rhymes to a shaky voice and teary eyes — and it never occurred to him once that things could do terribly wrong. Sonam said no. She politely turned down his love for her with a smile of her face but stern voice. Romeo, aloof to the idea of a woman saying no, refused to give up. She was playing hard-to-get kind, he thought. So he did what he thought was right, again. Then came letters written in blood, then came photos of slit wrists, then came drunken calls from the man, pleading with Sonam to accept his true love, and it ended with the fellow consuming many sleeping pills at a time to end his life without her love. Nothing worked, simply because she was not in love with him. Sonam did not go running to the hospital, nor did she call to profess her love in tear-torn voice. She only prayed for his recovery, because humanity, and prayed that his failed suicide attempt will make him wiser. He recovered, but he was just a human body filled with hatred, anger and dirty male-ego. A jilted lover now, he began stalking her with a bottle of acid in his pocket. Sonam, as we told you, was not just another girl. She informed the police about the aashiq-turned-stalker, and they caught him before he could harm her. By the time he came out of the prison, Sonam was long gone. When the reality of a woman’s consent failed to make sense, the Raanjhana resorted to vengeance again. He wanted to tell his tale, make her unpopular. A 10 rupee note became his tool. Three years later, here we are jabbering about many notes with ‘Sonam Gupta bewafa hai’ scribbled on them and her name becoming the face of betraytal. Sonam Gupta, as a rumour has it, laughed out in the middle of a meeting, when her editor told her about #sonamguptabewafahai. Disclaimer: This is a work of fiction, but an attempt towards popularising the idea of consent.